Ambrane A-7 Ultra Slim: Ambrane, a near household name now, has come up with one of the cheapest Tablet PCs in the market. But by pricing it at a cheaper value, they don’t mean compromising with the quality. 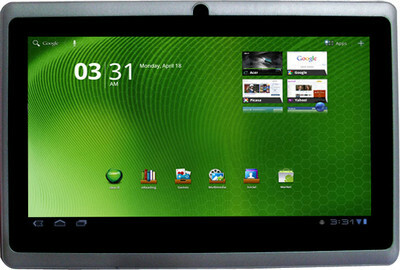 The tablet is no lesser in specs and corresponding features than any of the lower budget segment players. The plus for this Tab is a decent display with 800×480 pixels. It is a good Tab if you want a typical gizmo feeling but by not spending a big amount out of your pocket. Have a look at the other vital notes presented to you in a tabular format below. Also check the SIM CALLING model from the makers off the A-7 Ultra Slim, the Ambrane AC-770 Tablet PC.